Jean Claude Van Damme Versus Somluck Kamsing: To Be or Not to Be? Jean Claude Van Damme Vs. Somluck? Greeting fellow scientists. I hope you’re sitting down because the rumored fight between Somluck Kamsing and Jean Claude Van Damme looks like it’s a reality. To be or not to be? – would seem to have been the question. 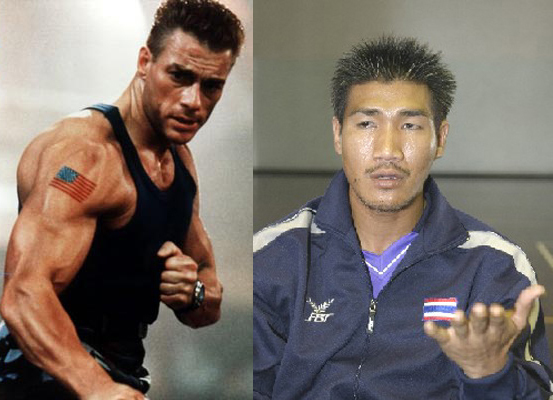 Thai Olympic gold medalist boxer Somluck Kamsing has confirmed the rumor that he will fight martial artist star Jean-Claude Van Damme in a Muay Thai match. Somluck is the first Thai gold medalist who won the featherweight boxing event at the Atlanta Games in 1996. In Thai media Somluck has confirmed the earlier report that he has signed a contract on September 4, to fight in a match against Van Damme, famed martial arts film actor. The date has since been changed to October 2010. The terms of the match according to Somluck are five two-minute rounds to be held in Las Vegas, in October 2010 using Muay Thai rules without elbows. He said he would be paid US$150,000 plus US$25,000 as training fee as well as a 2% share from broadcast revenue. “I never thought about this possibility at all, but all of the sudden Van Damme’s team called me, saying they tracked me down from a hotel employee who knew me. They want me to fight with Muay Thai style, except the elbows because they don’t want his face to get bruised, because he is an actor,” said Somluck. Somluck said Van Damme knew him from a K-1 event in Turkey he fought earlier this year. Interestingly enough in the mid-2000s Van Damme was quoted as saying he wanted to fight in K-1. Van Damme’s participation a K-1 event would never become a reality. Somluck said he would have to prepare himself well in order to fight the much larger Van Damme, but believes he would be able to defeat him with his superior Muay Thai skill and experience. Somluck rose to prominence with a number one ranking at 57 kg or 126 lbs in all the stadiums, notable wins in Rajadamnen stadium and a thus far compiled record of over 300 Muay Thai bouts, 12 losses and 1 draw.Somluck has continued to compete sporadically to the present. Jean Claude Van Damme is known best for his acting roles in Hollywood produced blockbusters as Bloodsport, Kickboxer, and Universal Soldier. Watch the clip of Jean Claude Van Damme confirming the match. This would be the first time I have seen any meaningful confirmation from the Van Damme side of this proposed match. Thanks for reading and I will certainly keep watching this topic as October 2010 draws closer. ~ by fatsoking on April 2, 2010. My dad will love the news!! LOL!! I think it will a very intriguing encounter between d two. I definately trust van Dam to win. I am sure Van Damme’s many years of kicking into the air and doing splits on chairs will prove invaluable! You know I am going to be eating a shovel full of Crow if JCVD wins! Not yet. LOL I thought I recognized that style of commenting. Welcome bro. wats up with the reality show? Allegedly soon! I don’t know if I want to damage mye eyes by watching it quite yet but I am certain it’ll come my way inevitably. I was hoping for Walker TX Ranger levels. It does! But JCVD’s busy schedule is changing things some what. So now it’s next July. JCVD is indeed afraid as he should be. the JCVD reality show is out suckas. the 3rd ep[i havent finished it] he talks about his fight with Somrak. So, the fight should be near now. Any news? Haven’t heard anything in Thai media. I don’t think Somrak is training seriously right now. So very unlike to ever happen. is this really going to be happen? As much as I would like to see it, Van Damme’s dilemma is not to fight another fighter, it is a fight within himself. He does not have to prove any thing to his fans, but only to himself and that is a bad combination. Though his intentions are felt and he means well and I understand that. However, his passion for fighting does not line up equally with a fighters’ mentality and attitude. He should bow out gracefully and keep his head up high. He has already made his mark. Should he fight, I wish my movie hero well and may the best fighter. So prove me wrong, JCVD.